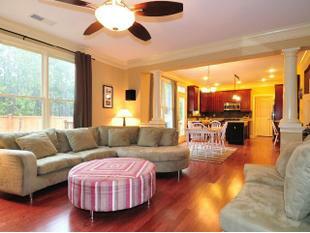 Other websites that I visit to research decorating ideas is simply Realtor.com. I love looking at Atlanta, Georgia and Charlotte, NC homes. Primarily because these two areas are growing and have a lot of new construction homes. These are also two areas that I would love to live in, but of course would never pull the trigger unless all my family decided to come with us. So for now, a girl can dream and just look at all the lovely southern homes. 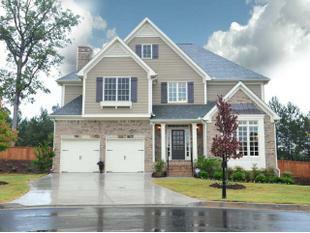 Here is a home that I particularly love in an Atlanta suburb. Look at this kitchen! 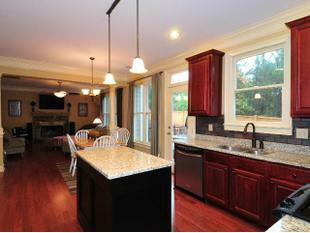 Look familiar with the cherry cabinets and light color granite? It reminds me so much of our home and even has the same decorating challenge as I do. Two sets of windows in the kitchen and great room with no real defining space. I was happy to see this home display two different, yet complimenting, color panels. It only reinforces my decision of going with two different color window panels. I think I am finally ordering the two tone grommet drapes from West Elm this week! I am so excited, I can't wait for them to arrive!! 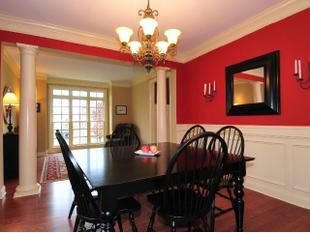 The kitchen is great and I LOOOVOE the architectural elements like the moulding and those columns!